I got back to Wichita Falls Saturday evening. I was tired and sick, but so thankful for the great trip. Sunday was a long day with two sermons, but it was great to be home. I cannot begin to adequately express my appreciation for those who made the trip possible and profitable in so many ways. Brethren from four countries send their thanks as well. 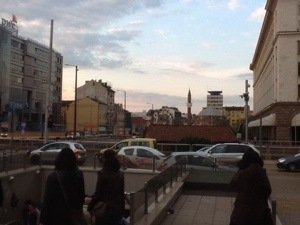 I spent the whole day Monday traveling back to Prague, but was up and running again on Tuesday. I spent most of the day with Honza and his family. He had spent a week thinking about our last meeting and had another series of ideas and questions he wanted to bounce off me. 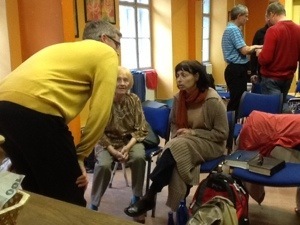 After some discussion he suggested we go visit a family who had been a part of the church in Prague several years ago. Though they were not home, I was thrilled that he had the idea. On the way back to Prague we stopped at the village of Lidice. (Google it.) this was the first place Nancy and I lived in Czechoslovakia 24 years ago. It still exists in spite of Hitler’s effort to wipe it from memory. 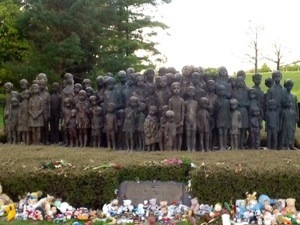 82 Czech children he had sent to the gas chambers are remembered there in bronze. 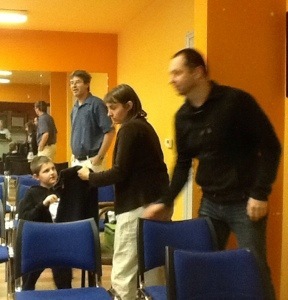 On Wednesday I met with one of the first people we baptized in Prague so many years ago. Both he and his wife were warm and kind. They are truly dear friends. For the first time in a long time I believe they are finding their way back to us. 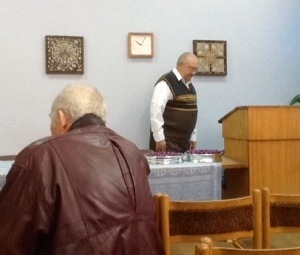 Sunday morning some of us visited the assembly of the Sofia Church of Christ. It is a group of about 50 older people. The assembly was encouraging and I look forward to good discussions with them. Biss, Aaron, Kremena, and I spent the next couple of hours visiting. Much of the discussion centered on the morning worship. That evening we met as a group for another period of worship. After the assembly, we spent another hour or so discussing the events of the day. 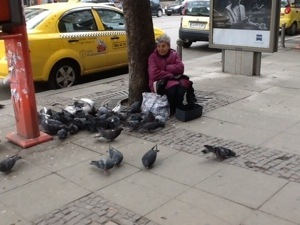 I spent the weekend in Sofia. With airline changes in Europe, getting there is now a day- long trip. I got to my flat with 10 minutes to spare before I needed to leave to meet Biss and Savella. Biss was earlier, so we had some time to catch up ad plan the visit before Savella arrived. It was a good evening. On a personal level, it was nice to have more than a hotel room, a bed bigger than a twin, and to do laundry. I took advantage of all of that on Saturday before meeting with Biss and Aaron for a few hours of visit and discussion. 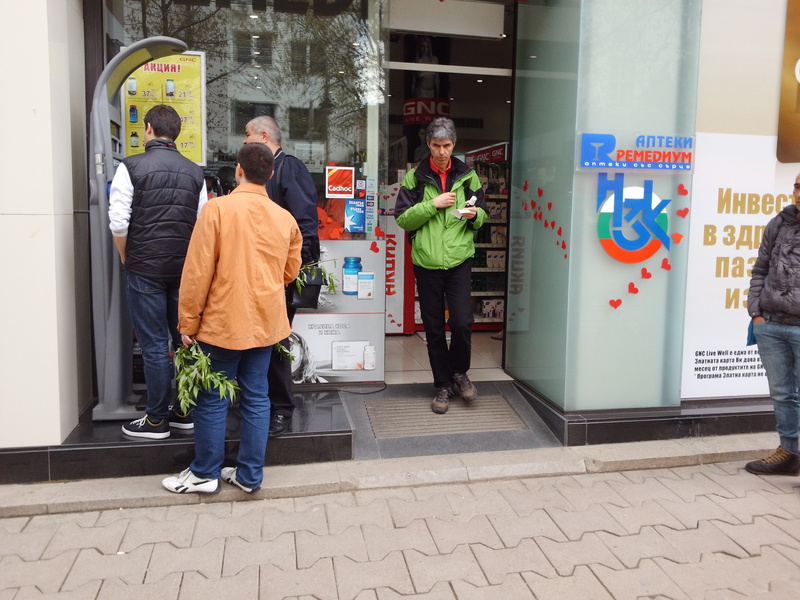 Monday in Prague was a highly unusual day. It was the first day since I have been here that I didn’t have a lesson, lecture, class, or study scheduled. It was a needed break that allowed me to catch up on some study and correspondence. OnTuesday, I met with Honza for a little while before the class at Mike’s. The class was well attended with three men from the other group showing up. The discussion was spirited as we talked about several currently controversial issues concerning The Lord’s Supper. After two hours everyone was tired and contemplative. The next day I met Mike to take him to lunch. The food was good and the discussion better. We dissected the previous night’s discussion and related principles. After the long meal we went back to his flat where Tatana joined up as the discussion continued. Ina ll we had about 5 hours of study and conversation. 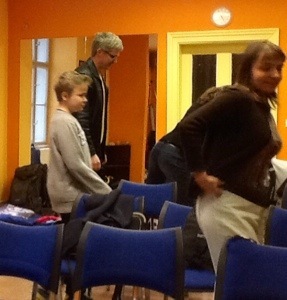 I worshiped with the church in Brno on Sunday. The crowd was small, but it was a great day. I had some left over questions from the previous day that I addressed in the lesson. After the assembly we had a great group discussion about how to specifically apply what we discussed. Once again I was privileged to lead the Brno Study. The entire 3 hours of classes was devoted to churches recognizing their responsibilities and implementing them. Leadership and communication received special attention. This kind of topic was needed. Both participation and response were very positive. Knowing these folks so well makes it much easier for me to be specific and detailed in a discussion like this. The turnout was good in spite of the road construction that hindered people coming from the west. One family traveling by car spent three hours getting to the study.. After the study several families stayed in the parking lot and talked for more than an hour. Their love for each other warms my heart.